As ecommerce continues to reach new and unprecedented heights, retailers are slowly coming to realize that they must take steps to truly integrate their in-store and ecommerce experience to meet consumer demands and expectations. The trend is becoming clear: Integrating your data throughout your business’ omnichannel mix is absolutely essential to keeping your business relevant and profitable. One retailer, in particular, has paved the way for an exceptional online customer experience that bridges seamlessly into bricks-and-mortar. Keep reading for our full account of how Gap Inc. is setting the standard for integrated omnichannel customer experiences, and our analysis of how their back-end likely informs this sleek and engaging suite of websites, customer service touch points, stores, and more. Every day we are told the mall is dying: retailers are going bankrupt at an unprecedented rate. Marketplaces like Amazon and Alibaba seem to be single-handedly taking over the world. In Canada, however, the shift from brick-and-mortar to ecommerce is on a pace all its own. Like molasses in January comes to mind. A prime example is how Canadians shop for clothing. “Canadian malls are doing okay because Canada is behind the curve when it comes to online shopping. While Amazon is now the No. 1 apparel retailer in the U.S and online sales account for between 10 to 12 per cent of overall sales, in Canada we’re still at about 6 per cent”, says Leah McLaren from the Globe and Mail. While American malls seem closer to museum displays than places of commerce, bricks and mortar retail seems to still have solid footing in Canada. “The majority of retailers are struggling to connect the digital and physical store to meet the expectations of consumers throughout their shopping journey.” Far too often ecommerce websites are clunky with only one or two product photos. Coupled with odd and inconsistent sizing guides (or none at all), these websites can be difficult to navigate, leaving the customer with feelings of anxiety or confusion when trying to decide whether or not to make a purchase. The end result, of course, is an abandoned cart and a lost opportunity for the retailer. For Canadian shoppers specifically, these issues are compounded further with painful shipping and return processes. It’s no small wonder Canadians still prefer bricks-and-mortar stores for apparel. Recently, I stumbled upon The Gap’s online store. Being the apparently prototypical Canadian of today and still preferring to shop for clothing in-store, I was pleasantly surprised by their online experience from start to finish. The Gap, Old Navy and Banana Republic (all owned by Gap Inc.) have created a seamless ecommerce experience that truly bridges the gap between in-store and online customer experiences. Gap Inc., collectively, have managed to create a recipe that still has broad appeal to the international etail community, but at the same time also solving Canadian-specific omnichannel pain points. First, all of Gap Inc.’s brands are integrated into a truly unified ecommerce site. Users can easily navigate between labels (and are encouraged to do so) via brand labels/buttons visible in the top left-hand corner of all Gap Inc.’s sites. This satisfies the innate desire for consumers to comparison shop while also encouraging the consumer to purchase from any Gap Inc. brand. Amazingly, any product added to your cart from any of the three websites is added to a single shopping cart: three websites perform as a single, unified unit. But there’s more: Gap Inc. also addressed one of the largest pain points with online apparel shopping – fit and sizing. The online product layouts allow for easy and logical navigation. Several angles of each product are provided in large formats and with detailed zoom capabilities, and sizing guides are clear and consistent across all three brand websites. But what really caught my eye is the feature video clips of a model wearing the product alongside the photos, allowing shoppers to see how the product moves and actually fits from all angles. This is a huge step towards bridging that in-store and ecommerce experience, and I’m calling it now: this kind of integrated video footage will be key to omnichannel success in 2017 and beyond. Only a truly integrated back-end system can handle the complex load of product information required to inform this level of sophistication in a front-end online user experience. Images, video, and other product data used to compile this front end are typically stored across a number of applications and/or programs; we at VL suspect that a minimum, a sophisticated PIM or PIM-like application is being used to push product data to the Gap Inc. websites. For consistency across sales channels (including online marketplaces and brick-and-mortar stores), this data needs to be stored in a central location — a central point of data truth, if you will, for each SKU Gap Inc. has available for sale. This means that Gap Inc. can take this ‘master copy’ of SKU data and push it out to any channel with the same level of detailed information — both visual, textual, and more. In today’s neck-breaking pace of ecommerce, review sections have grown beyond the basic 5-star rating system into communities of brand advocates. These product reviews are essential in brands building trust with their customers. In fact, 67% of customers trust recommendations from family and friends over other sources. 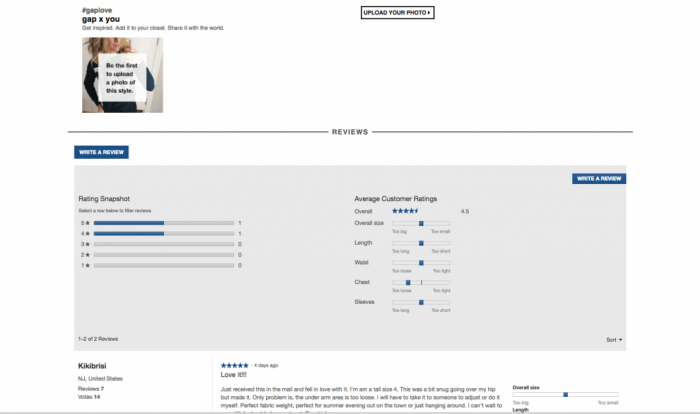 The growing trend in online retail is multi-faceted review portals that encourage reviewers to input multiple dimensions of their experience with the product. Common data entry points include height, weight, and size of the garment they purchased, with some even allowing for image uploads of users actually wearing the piece. Together, this all works towards creating and nurturing brand advocacy and organic user communities. Together, all of these product features create a really smooth and painless user experience that allows the customer to feel confident in the look of a product, its material, fit, and value. These seemingly small but extremely helpful features work incredibly well in merging the online and offline shopping experiences. But brands considering these strategies should be well warned: this experience must be consistent across all customer touch points for maximum impact. Consistency across platforms is absolutely key. A customer must have the same experience from whichever platform or physical location they choose to buy from. For your business, this means tight integration between each ecommerce site and all back-end applications that are necessary for informing this front-end customer experience. From sophisticated marketing automation, faster shipping and delivery times and much more, the power of insight into all your commerce channels is directly related to the quality of your data integration. A major thorn in my side when shopping online is the return process. International shipping to Canada usually requires that the customer bears the cost of shipping, including any cost of return shipping. Once items are returned, there is usually no real guarantee of refund or exchange. Customers – especially Canadian ones – expect a long and error-riddled process from online returns. I definitely count myself as one of the many Canadians who would rather skip this painful process and simply buy or return something in-store. What sets Gap Inc. apart is they truly make the return process simple and seamless between online and in store purchases. Offering free shipping above $50 dollars and free returns on all orders (and even going so far as to provide customers with a prepaid return shipping label), Gap Inc. is among sophisticated omnichannel brands like Nordstrom and Sephora in the level of unification they’ve achieved in merging the online and offline customer experiences from start to finish. Gap Inc., Nordstrom, and Sephora all allow returns to be made in-store with a valid purchase invoice that is as simple and painless as scanning a barcode — and that’s it. From a business standpoint, the back-end integrations that allow this seamless process of shipping, returns and exchanges both online and in-store is complex. Transparency through the supply chain is critically important to customers, and that requires that all data movements must be tightly integrated and automated, and happen near real-time. At VL, our VL OMNI cloud hosted one-to-many data integration service is designed to manage complex and sophisticated data automations and integrations like those used by Gap Inc.’s sites. Our philosophy is to provide 100% integration of data movement for our customers so that they can focus on running and growing their businesses. About how VL can help your business tie all your commerce and supply chain data together into a single solution that grows with your business.